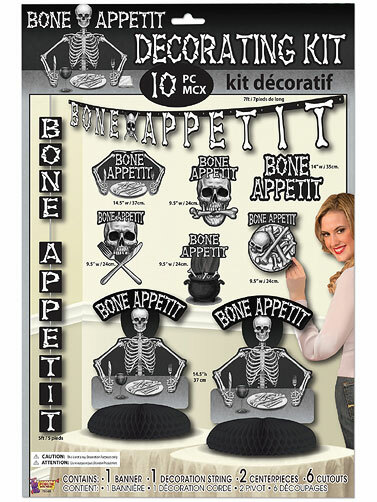 Bone Appetit Party Decoration Kit includes all of the basic decorations needed for a complete party look. Spooky skeletons, bones and more in this decorating kit that includes 1 paper banner, 1 paper string decoration, 2 honeycomb and paper centerpieces and 6 assorted paper cut-out decorations. Matching Bone Appetit decorations and tableware is available. Each sold separately. Centerpieces measure 14"H, and the cut-outs measure 9.5" - 14.5". 10 pc.